Residents say they are angry and disappointed after plans to build a £5m cancer centre in Taunton on protected land were approved. 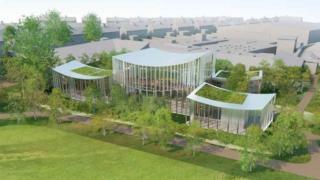 Taunton Deane Borough Council approved the Maggie's charity plan to build the centre on land at Galmington Playing Fields, next to Musgrove Park Hospital. Campaigner Bev Fernandes said: "I'm very disappointed but the fight will go on." The charity said the land was "a very small section and poorly used". Maggie's wants to use 20,000 sq ft (1,850 sq m) of land south of Musgrove Park Hospital, next to an existing cancer unit. Planning documents revealed other areas were considered but would have required demolishing buildings. Belinda Flinn, a member of the Friends of Galmington Playing Fields, said: "Maggie's have chosen to have no consultation with local residents or users. "Our streets are already heavily congested with people who are either unable to park at Musgrove or unwilling. "The car parks at Musgrove are at capacity every day, and queues extend back to the main hospital entrance." Colin Heapy added: "There is a covenant on the land which unequivocally states that there should be no building on the land - this appears to have been totally ignored." The playing field was gifted to the people of Taunton in 1931 by the town's former MP Brigadier Andrew Hamilton Gault. Planning officer Tim Burton said the covenant on the land was "totally irrelevant" and had to be dealt with separately to the application. The council's planning committee voted to approve the scheme by a margin of eight votes to three. Maggie's will now need to raise £5m to pay for the building. The campaign group said it was considering legal action.